I would have thought John Robert McCulloch would get his keester sued off. But maybe he’s right and it’s the soda people who grabbed his brand and ran with it. 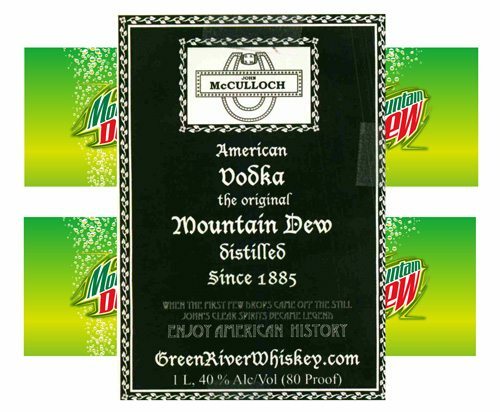 The approval mentions that “Mountain Dew is the brand John McCulloch sold vodka under from 1885 until put out of business by Prohibition.” I’d wager that’s earlier than Pepsi or any of its forebearers put the lithiated green soda into commerce. As it turns out, Wikipedia confirms that: “The original formula (for the soda) was invented in the 1940s by two Tennessee beverage bottlers, Barney and Ally Hartman, and was first marketed in Marion, VA, Knoxville and Johnson City, Tennessee. … The Mountain Dew brand and production rights were acquired by PepsiCo in 1964, at which point its distribution expanded more widely across the United States.” The Hartmans got the name from “a colloquial term for moonshine whiskey” and got the trademark rights soon after.